Bars, drinks, alcohol, you name it. We’ll review it. deluxe | mixology had its first ever US Bartenders Guild event last Monday. Karlsson’s Vodka hosted the annual Christmas party (ugly sweaters included!) in the upper bar/room at the Lincoln Room in downtown San Diego. Kevin and I both had a great time rockin’ our sweaters (reindeer and Christmas trees along with a Buddy the Elf hat) and mingling with the local talent. Bartenders came from all venues including Nobu, the Hilton, Prohibition, Nicky Rotten’s, and Snake Oil Cocktail Co. We also got to meet Monetta Ennis, the area sales manager from Karlsson’s Vodka which I enjoyed because I was interested in what Karlsson’s was about and she was more than happy to share all about the company. 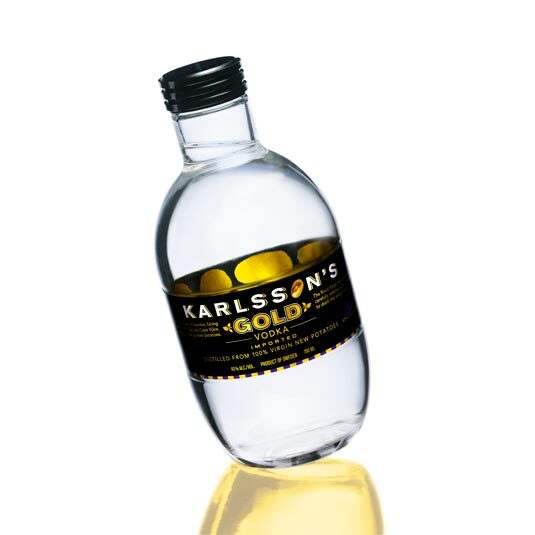 As it turns out, Karlsson’s takes the flavorless aspect of vodka and turns it on its head. Rather than producing a neutral spirit, Master Blender Borje Karlsson created a recipe that showcased Sweden’s famous staple in the form of a hand-made blend of seven varieties of virgin potatoes from the exclusive Cape Bjäre in the south of Sweden. The vodka is carefully distilled once (not the usual 6 or 7 times), in an unfiltered process that keeps the characteristics and flavors of the unique ingredients. What you get is a vodka with natural, not neutral, taste and quite a different vodka experience. I tried it so I could witness how Karlsson’s was different. First in a punch, then on the rocks and lastly as a shot. The punch was tasty and didn’t leave much room to experience the vodka. However, when I drank it on the rocks I was met with a smooth alcohol and an earthy, potato flavor that added a richness and depth to an otherwise bland spirit. The shot went down easily enough but as this is a sipping vodka I’d try to stay away from shooting it unless the party is really bad. Definitely liked the flavor as it opens up unlimited combinations of drink concoctions but can also be enjoyed on its own. Appetizers were made their way around as well, all of which were tasty. Overall the party was a sweet way to meet up with a bunch of San Diego barkeeps, try some great booze, and spread a little Christmas spirit (!) – bartender style. A special thanks to Karlsson’s for putting it on and thanks to the Guild for the Williams-Sonoma floating mulling spice ball. 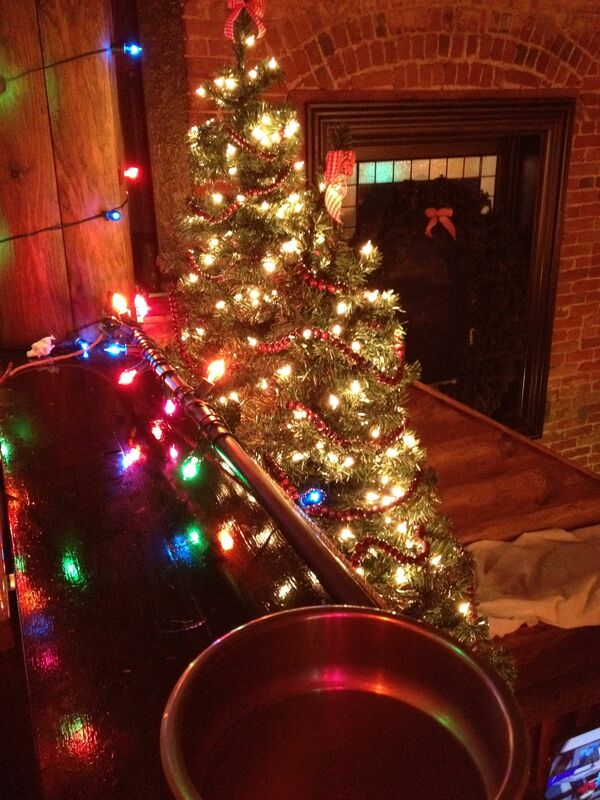 Wishing everyone from the Guild, Karlsson’s Gold, and the Lincoln Room a very Merry Christmas and a Happy New Year! 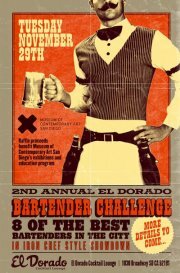 On November 29th, deluxe | mixology attended the 2nd Annual El Dorado Bartender Challenge. In Iron Chef style, bartenders from all different venues in San Diego faced off against one another with only their skill and experience (plus a secret ingredient that was only revealed immediately before each round) to rely on. It was a friendly competition with an assortment of personalities, hats, and banter, but overall was a cool way to see the local talent in action. Among the contestants were last year’s winner Anthony Schmidt from Noble Experiment, Prohibition’s Tim Stevens, and Christian Siglin from Craft & Commerce. 4 of the 8 contestants competed in the first round and the next 4 followed in the second. The 5 featured judges were looking for originality, presentation, and balance of the concoctions. Each scored the three categories from 1-10. The “secret ingredient” for these two rounds was Kahlua, and bartenders used ingredients like gin, Campari, and mint, among other ingredients. Sarah Ellis from Jayne’s Gastropub, Tim Stevens, Anthony Schmidt, and Dustin Haarstad, co-founder of Blind Tiger, were the winners of the first round. Anthony’s bourbon highball with bitters and ginger defeated Sarah’s “Swizzle My Nizzle” with gin and fresh lime juice in the following round putting last year’s winner and Dustin Haarstad in the finals. The bartenders took a break before the last round so it was the opportune time to try a drink from El Dorado’s Fall Cocktail Menu. I went with a Honey Badger (rye, honey, bitters) while Kevin opted for a Moscow Mule (vodka, lime juice, ginger beer, bitters). Both were simple yet tasty and we appreciated the freshness of the beverages. For the final round the “secret ingredient” was a Spanish sherry. Both Anthony and Dustin looked calm and ready and the TV screens on either side of the bar showcased both mixologists fashioning their drinks. The 4 minute round ticked away and after the time ran out, judges started tasting. After a few minutes the judges turned in their score sheets and the points were tallied. 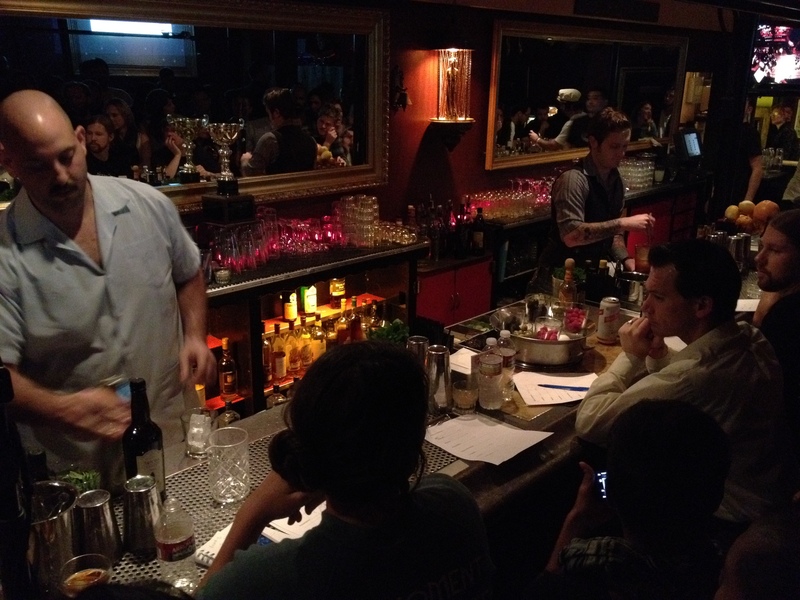 With the points added up the winner was announced: Noble Experiment’s Anthony Schmidt, the now two time El Dorado Bartender Challenge champion. We watched him take a celebratory chug from his trophy after being announced. For his drink Anthony went with Famous Grouse, lemon juice, and honey and it tipped the judges just the right way. Congrats to Anthony! Definitely a cool event and it was fun to see the local talent competing against each other and doing what they do best: mixing drinks! Thanks to El Dorado for putting this on! 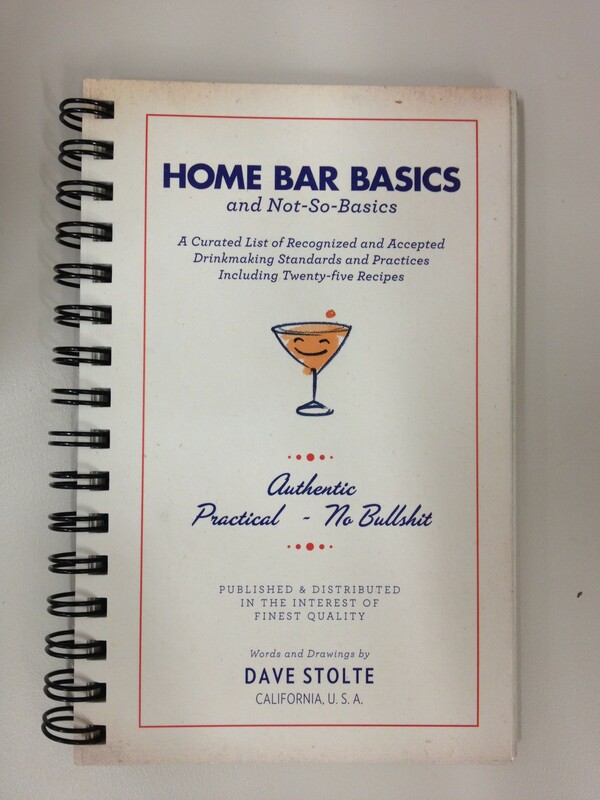 Don’t let the small size of this book throw you off (as I almost let it) because Home Bar Basics is chock-full of pertinent information, years of knowledge, and some fascinating tips. Author Dave Stolte, utilizes his passion for craft cocktails to write an entertaining and simple manual that teaches the reader what to drink and how to drink it. Say no more to juice and vodka and say yes to the world’s most classic cocktails, presented in an easy to learn way. Complete with a list of spirits to stock your home bar with as well as timeless recipes, histories behind the alcohols used, and the proper way to make each drink, Stolte does a great job of getting to the original roots of some of the most well-known drinks today. He shares recipes for homemade mixers that really add to each drink and give them the freshest and most enjoyable taste one could hope for. Recipes include the basic Old-Fashioned, Mint Julep, and the Martini, and the not-so-basic Jack Rose, Zombie, and El Diablo. Lastly, be prepared to spend a little more on alcohol because Stolte is all about enjoying the best spirits in these drinks. You’ll thank him later when you realize just how much of a difference it makes. Quality over quantity is what Home Bar Basics is all about. Hope you enjoy it as much as Kevin and I have! Kevin and I had the chance to attend the All-Star Mixologist After Party for the 8th Annual Wine and Food Festival in San Diego. 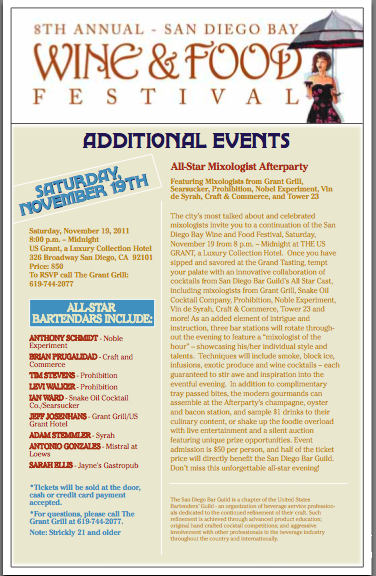 It took place last Saturday at the US Grant Hotel and was put on by the San Diego Chapter of the Bartender’s Guild. Three cocktails were prepared each hour by the different mixologists and every hour the bartenders and the drinks would change allowing Kevin and I to sample 8 different cocktails! Flavors ranged from strawberry infused vodka to chai eggnog to a champagne and scotch cocktail dubbed “a bottle of champagne left next to the campfire.” The drinks were interesting, tasty, fresh, and experimental but provided a great way for the bartenders to show their talent by adding their own creativity and talent and even some of their homemade ingredients. This recipe was not included because it is a secret family recipe according to Tim Stevens, head bartender at Prohibition and President of the San Diego Chapter of the Bartender’s Guild. Complete with live music, an oyster bar, and more cocktails than one could ever drink, Kevin and I had a great experience networking with the mixologists and experiencing the local talent. We both agreed the best drink was the “Holiday Sauce” as made by Seth Laufman from the Palomar Hotel. It tickled the palate just right with the IPA and then smoothly finished with the spiced persimmon cranberry syrup that added a great holiday taste to the drink. The most surprising part of the event was the friendliness of the bartenders. All were excited to share their drink inspirations and chat with us. Several asked us to come in and visit, even offering to cover the first round of drinks. We are definitely excited about visiting some new bars and restaurants that these bartenders call home and joining as members of the San Diego Chapter of the Bartender’s Guild.